The National Council for Road Safety announced last week that fare metres for trishaws (tuk tuks) will be mandatory and the law would be strictly enforced after April 30. Accordingly trishaw drivers will now be required to provide the customer with a printed bill, indicating the fare and details of the journey. Interestingly, officials said however that they would not intervene in the manufacturing of taxi metres, but noted that metres must be manufactured keeping with the standards and specifications stipulated by the Ministry of Transport. Not all three-wheel drivers were in agreement with these mandatory laws. President of the Lanka Self Employed Professionals National Three-Wheel Federation, Sunil Jayawardana said his association strongly opposes the new regulations due to several reasons. “The National Council for Road Safety (NCRS) previously made a similar statement, following which we held discussions with the Chairman of the Road Passenger Transport Authority. We made our concerns very clear. There is no standardised metre available in the market. When the metre unit is not provided by the Government, they have no right to demand that we install a metre. We are in possession of evidence that this is the result of a deal made among several trishaw associations, metre vendors and NCRS officials,” Jayawardana charged. According to Jayawardana several parties with vested interests are attempting to sell 100,000 units of taxi metres with the new regulations in place. “An officer is making a profit of Rs. 10 from each unit sold and we have evidence to support our statements. We are not interested in making individuals or companies profit and therefore we demand that the Government introduces an affordable and standardised metre,” he alleged. “On several occasions, we have requested meetings with the President, but our concerns have been ignored by the authorities. Therefore we have resorted to operating tuk tuks without the metre and with increased fares,” said Jayawardana speaking of the federation’s attempts to discuss its issues. These concerns include the high cost of spare parts, sale and distribution of counterfeit spare parts as well as the overall lack of regulation of the three wheelers operating island-wide. 0,000 trishaw drivers. We have continuously requested for a regulatory authority and yet they have merely been promises made during Budget speeches,” Jayawardana said. “Metres are installed at costs varying from Rs. 8,500 to 18,500. These are sold with a considerable margin and huge profits for companies selling them,” he charged. Jayawardana is of the opinion that if regulation is to take place, the metre fares must change according to the area where the driver operates. “The metres must be issued and licensed by the Department of Measurement Units, Standards and Services, in order to bring fares under state control,” he said. Jayawardana however holds a different view regarding mobile app based taxi services, a view that apparently pays no regard to safety or convenience of the passenger. “The government has allowed local and international companies to operate in Sri Lanka to discourage trishaw drivers. Under the Megapolis plan, the Government has opted to do away with trishaws in the city. Authorities are simply trying to dispose of trishaws,” Jayawardana alleged. “In services such as ‘Pick Me’ the waiting charge is double the amount a regular driver charges. Passengers are tricked into thinking that their services are economical when it is not. Beyond Colombo however, the Government would find it extremely difficult to discourage the operation of trishaws,” he said. The Southern Province Road Passenger Transport Authority says that following the gazette notification almost 1,300 trishaws have been registered with them. “Meanwhile there are moves to introduce a new vehicle called the quadricycle to replace the tuk tuk. This vehicle has not even been approved for passenger transport in India, where it is manufactured. Yet, it is set to be launched in Sri Lanka soon, with the support of authorities who are involved in this massive scam. We have carried out a campaign of petitions against this move,” Jayawardana said. On April 10, several civil society groups including Jayawardana’s group, handed over a petition to the Indian High Commission against the attempt to import the Indian manufactured quadricycle. Quadricycles are four-wheeled micro-cars with relative restrictions in weight, power and speed. The four-seater vehicle manufactured by Pune-based Bajaj Auto, named the ‘Qute’ is exclusively manufactured for export markets at present. Its launch has been stalled in India due to the vehicle’s safety features being challenged in Supreme Court, despite the Indian Government’s go-ahead to introduce quadricyles as a new vehicle category. The European New Car Assessment Programme (Euro NCAP), a Belgium-based automobile crash test agency, gave a single-star safety rating to the Bajaj Qute quadricycle. One of the main reasons for the Qute’s poor performance in tests was due to the absence of basic safety features such as driver or passenger airbags. In a letter to Bajaj Auto, Euro NCAP stressed that the Qute does not perform well in terms of safety and has misled consumers. 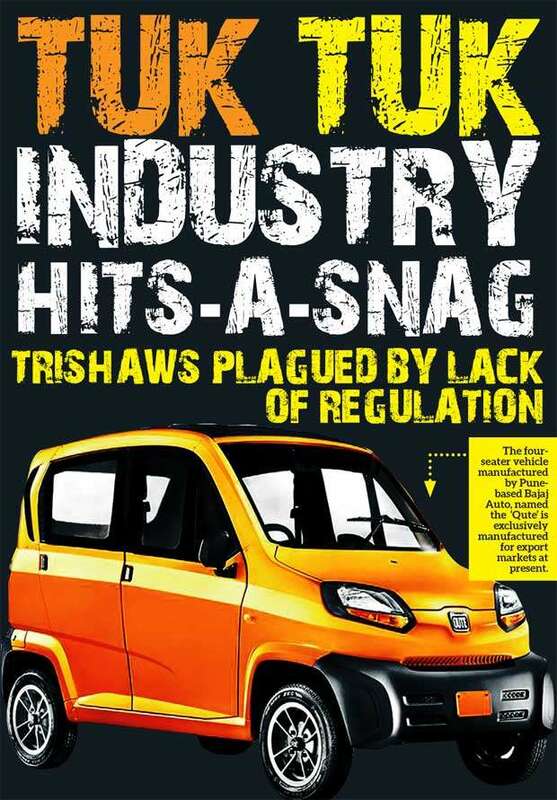 Even without the safety options offered by similar micro cars, President of the All Island Three Wheeler Drivers’ Union, (AITWDU) Lalith Dharmasekara believes that the import of quadricycles to Sri Lanka would provide a better option for passengers. “If I am able to purchase a quadricycle, I would, simply because it offers the safety a trishaw cannot,” Dharmasekara opined. “Even if there are moves to introduce the quadricycle, it should not be a cause for worry,” he added. Dharmasekara believes that stressing over the impending imports of quadricycles is futile as it shifts the focus away from the real issue. “The industry has not been regulated for over 30 years,” Dharmasekara said. “The disorganised nature of our profession is in fact the issue which needs to be addressed promptly and it is one that we have been demanding for a long time,” he said adding that members of the AITWDU had not been a part of any trade union action. “The metre fares were introduced through a properly calculated formula in 2005. With the rise in the cost of living, we obviously have countless reasons to raise the fare and many drivers have even done so. But resorting to trade union action of operating without a metre is an ignorant and unwise decision. Their arguments are presented with no understanding of the situation,” he said. “There are Nano taxi services which provide the passenger more comfort and safety for just Rs. 40 per kilometre. I simply can’t imagine that the passenger would prefer to board an expensive trishaw operating without the metre, when they have the option of using a much cheaper taxi which is not only reliable, but also secure and can be hailed at their convenience. Therefore we cannot agree with their actions,” Dharmasekara said referring to the trade union action taken by the Self Employed Professionals’ National Three-wheel Federation. However the AITWDU has been demanding for a regulatory authority for many years following the rapid degradation of three-wheeler services across the island. “This Government made many promises before it assumed power. Budget speeches were made by two ministers, but we are still waiting for them to deliver,” Dharmasekara lamented. “What we understand is that the officials too are rendered helpless. We have been informed that in order to establish a regulatory authority, many departments have to be consulted. The Attorney General’s Department, provincial councils and even the Tourist Board is involved in consultations. The process has been botched and delayed for years. This is the result of grave and widespread inefficiency among a host of Government authorities,” Dharmasekara pointed. The four-seater vehicle manufactured by Pune-based Bajaj Auto, named the ‘Qute’ is exclusively manufactured for export markets at present. Several attempts to contact the subject Ministers and the Secretary to the Ministry of Transport proved futile. However Senior Assistant Secretary K. G. Dharmathilaka, informed the Daily Mirror that the duties of the Ministry are limited to the formulation of policies. “This is a decentralised subject. We have no authority or capacity to regulate trishaw operations. This subject of regulation comes under the purview of the provincial authorities,” Dharmathilaka said. Asked if there were any discussions held on the subject at Ministry level, Dharmathilake said the Ministry is involved in the making of policies and drafted the technicalities which have been included in the gazette and no further deliberations are being made at present. The Daily Mirror spoke to several provincial authorities regarding the subject. The Western Province Road Passenger Transport Authority Chairman Thusitha Kularathna said the authority is still drafting a mechanism to regulate trishaws in the Western Province. Asked when the proposed regulations would come into effect, Kularathna said he is unable to give a time frame for such work. “Our proposals and plans have been submitted to the Legal Department. We have requested the officials to deliberate the matter at the earliest, so that we can promptly implement a system to regulate trishaws,” said Kularathna. According to Kularathna the new system, once implemented, would make the profession accountable and thereby address several areas of concern. Operations and Planning Officer of the Southern Province Road Passenger Transport Authority said that following the gazette notification, almost 1,300 trishaws have been registered with them. “Through registration we are attempting to secure their services and control the excess of vehicles in three-wheeler stands. This would also discourage malpractices among trishaw drivers,” the officer said. “However the registration process has been stalled for some time now. We have encountered an obstacle as we have no legal authority in certain areas in which we have to deal with the Police. To rectify this situation we need the intervention of the Motor Traffic Ordinance, as the provincial councils have no legislative powers. Since there is no solution to this obstacle, the registration of three wheelers has been slow,” the officer said. Meanwhile an official of the Central Provincial Council Transport Department said that although decisions were made to regulate trishaws in the Central Province, it has not been implemented thus far. “There are various issues which have been voiced by three wheel drivers’ associations across the province. These issues are being addressed by the respective divisional councils,” the officer said. Pointing out to the persistent issue in regulation the officer said it is a difficult task to educate the three-wheel driver community due to several factors. “Thus far we have engaged in various awareness and education campaigns to elevate the three-wheel drivers in the province to a professional level. Unlike with other areas of transport, it is extremely difficult to educate or provide training in this sector. The main reason for this is the age groups involved. There are three-wheel drivers ranging from 18 to 70 years of age within this group, which makes their training all the more difficult,” he explained. Sri Lanka’s three wheeler population has been on the rise. As the numbers indicate, Sri Lankans have chosen the tuk tuk as their preferred mode of transport. Regardless of whether this is a positive or negative development, lawmakers must ensure that the much needed regulations tabled in 2016 and gazetted in 2017 is enforced at least in 2018. With a total tuk tuk population of 1,062,447 registered in 2016, it is time that a comprehensive policy to curb over-population is introduced. Let’s not forget that while the tuk tuk provides for a relatively affordable and comfortable mode of transport in the absence of satisfactory public transport, the vehicle is also the poor man’s trusted mode of transport in emergencies. Like it or not, the trishaw has become an integral part of the Sri Lankan transport system and hence its regulation must not be haphazard and ad-hoc, but meaningful and positive.